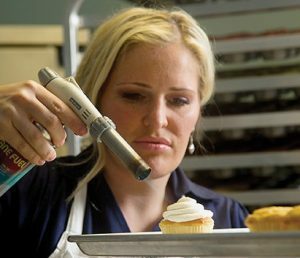 Megan Faulkner Brown creates bakeshop havens and wins honors—one cupcake at a time. When Megan Faulkner Brown (’02), of Lehi, Utah, walked into her local bank in April 2012, the teller began insisting he knew her from somewhere. “I didn’t know him, but I finally asked whether he ever watched the TV show Cupcake Wars,” Faulkner Brown says. Instantly recognizing her as a contestant on the show, the teller popped from behind the counter and asked to have his photo taken with her. 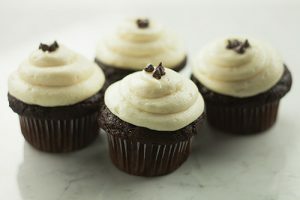 Cupcake Wars had aired the previous night and Faulkner Brown had walked off with the $10,000 first-place honor for creating cupcakes using ingredients that ranged from Brie cheese and cranberries to sweet potatoes and hazelnut cocoa spread. Winner of the Cupcake Wars and featured on Rachel Ray, Megan Faulkner Brown is the Sweet Tooth Fairy, and baking cupcakes is her specialty. Photo by Bradley Slade. Faulkner Brown continued working for Cannon two political cycles after she got married, until he lost his 2008 reelection bid. If, as Faulkner Brown asserts, baking is magic, then one of the Sweet Tooth Fairy’s magic wands is the blowtorch. Photo by Bradley Slade. She considers herself a “foodie” and sought others interested in food through the blogosphere. An especially fortunate blog connection came through a popular site called CakeSpy.com. She sent a selection of her cake bites to Jessie Moore Oleson of CakeSpy, who then listed them among her 25 top treats that year. Employees from the Rachael Ray television show saw the list and contacted Faulkner Brown in 2009. She was invited to participate in a segment of the show called “Snack of the Day” and prepared 900 cake bites for the audience. 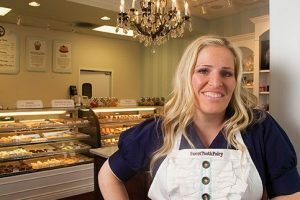 It was hectic timing because she and her husband, Ethan, were within three weeks of opening their first Sweet Tooth Fairy shop. More than a thousand cupcake fans visited the store the first day. Many other orders followed, including a 2011 debut appearance on the QVC shopping network promoting Valentine’s Day with a package called “Love at First Bite.” More than 36,000 of her cake bites sold in seven minutes. Faulkner Brown appeared again on Rachael Ray in spring 2012 to highlight how being on the famous cook’s show has changed her life. And word continues to spread about the Sweet Tooth Fairy. Preheat oven to 350 °F. Line 24 cupcake pan cups with paper liners. In a large bowl, mix the dry ingredients together with an electric mixer on low speed for 30 seconds until well combined. Add wet ingredients and mix on medium speed for 1 minute. Stop and scrape the sides of the bowl and resume mixing on medium speed for an additional minute. Stop mixer and fold in chocolate chips. Fill the prepared cupcake liners with batter 3/4 full. Bake about 15–18 minutes in the preheated oven, until a toothpick inserted in the center of a cupcake comes out clean. Let the cupcakes cool completely before frosting. To make the frosting, beat cream cheese and butter in a large bowl with an electric mixer on medium speed for 1 minute. Add melted chocolate and vanilla; mix for an additional minute. Add powdered sugar gradually, beating until light and fluffy after each addition. Spread the frosting on the chocolate cupcakes. Garnish with fresh raspberries, mini chocolate chips, or chocolate sprinkles. For celebrations, surprises, or solace, ice cream earns its rep as students’ go-to indulgence.